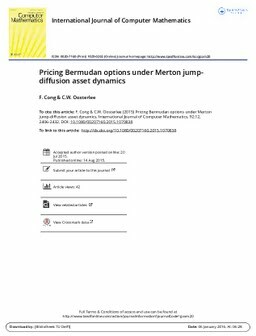 In this paper, a recently developed regression-based option pricing method, the Stochastic Grid Bundling Method (SGBM), is considered for pricing multidimensional Bermudan options.We compare SGBM with a traditional regression-based pricing approach and present detailed insight in the application of SGBM, including how to configure it and how to reduce the uncertainty of its estimates by control variates. We consider the Merton jump-diffusion model, which performs better than the geometric Brownian motion in modelling the heavy-tailed features of asset price distributions. Our numerical tests show that SGBM with appropriate set-up works highly satisfactorily for pricing multidimensional options under jump-diffusion asset dynamics.